Be the first to share your favorite memory, photo or story of Catherine . This memorial page is dedicated for family, friends and future generations to celebrate the life of their loved one. 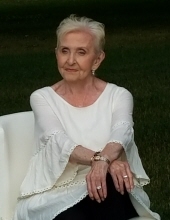 Catherine Perushak of Wayne, passed away January 29, 2019. She was 90 years old. Catherine was the beloved wife of the late Ernest. Loving mother to Cathie (John) Tonkovich, Pattie Perushak, Karen Mulholland and Todd. Proud grandmother of Natalie (Fiance, Steve) Tonkovich, Drew, Heather (Aaron) Phillips and great-grandchildren, Connor and Hunter. Catherine had a love for her family, friends and animals. She loved traveling with family and spending her children's inheritance on traveling with them. She will be greatly missed by her family, her friends and all who know and love her. Friends may visit the Schrader-Howell Funeral Home, 280 South Main Street, Plymouth on Saturday, February 2, 2019 from 12:00 P.M. until the time of the Funeral Service at 4:00 PM. In lieu of flowers, memorial donations may be made to Almost Home, P.O. Box 250602, West Bloomfield, Michigan 48325. "Email Address" would like to share the life celebration of Catherine Perushak. Click on the "link" to go to share a favorite memory or leave a condolence message for the family.